Subject: Fixed my missing wrench problem today. Fixed my missing wrench problem today. Took me most of the day to make a holder for them and get it mounted to the wall but I got it! One of every size craftsman makes. Tomorrow I should get sockets from Tekton. They are a new company out of Grand Rapids, Michigan. I'll let you know what I think of them when I get them in my dirty hands LOL. After previewing this post it looks like I should start saving some beeer money to put towards a camera thats not color blind. Re: Fixed my missing wrench problem today. No more missing sockets. Impressed with these Tekton tools, very good quality and finish. 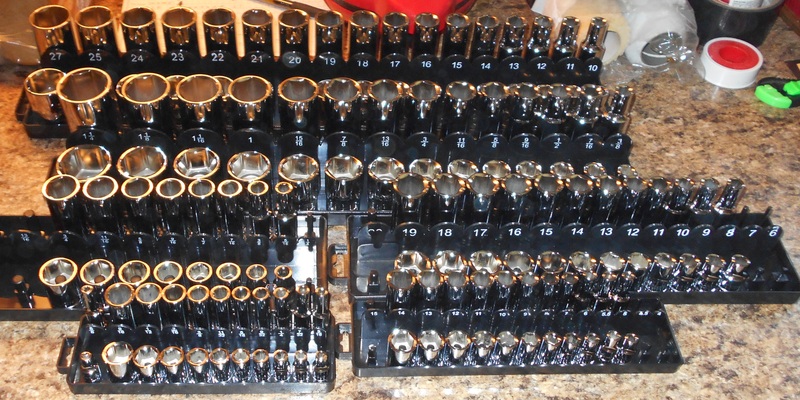 Need to find a better organizer, Now I have more sockets than the 1/2" drive organizer has. got them from Tekton 1/4", 3/8" and 1/2" drive all 6 point each size they make. Damn heavy set when you add in all the ratchets and extension they included. They look good Dan. Well organized and looks like 6 point. Those strips are good for when one is missing. I have 2 of the Tekton torque wrenches and am very pleased with the operation and quality.